Dale Dougherty wrote an interesting post on O’Reilly Radar titled Admiring Bill Gates. The centerpiece of the post is the recent interview that Gates did with Charlie Rose (Dec. 21, 2008) which is embedded below. The interview gives us an inside look at Gates life post Microsoft and in it he comes across as extremely thoughtful and authentic. As to be expected, there are several comments to Dougherty’s post that present a different opinion of Gates and several others that rise to his defense.� Personally, I feel that Dougherty hit the mark. 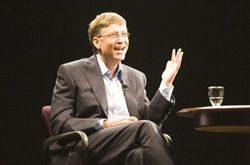 Bill Gates was an extraordinary business leader that has grown into a remarkable philanthropic leader. The Gates Foundation’s work is leading the way for some of our most challenging social issues at a time that will require innovation and scale. Tagged with Bill Gates, Gates Foundation, Microsoft, philanthropy. Thanks for pointing me towards this video. Very inspiring. People like Bill Gates and Warren Buffett can definitely help reduce the inequities in this world that we live in. May more wealth go to people like himself so that it gets channelized into mobilizing resources for solving pressing problems of humanity!